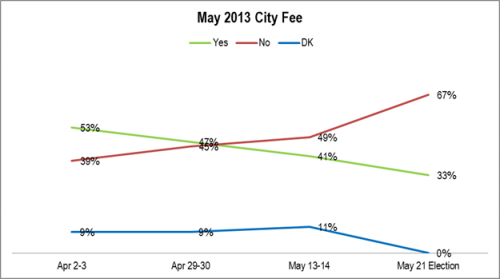 There is no clear support for Lane County increasing vehicle registration fees. This is natural considering the low level of trust in county government and in measures pushing non-standard taxes. QUESTION If the election were held today, would you support or oppose an increase in the vehicle registration fee by Lane County to pay for road maintenance? IF SUPPORT OR OPPOSE: Is that strongly or somewhat? IF DON’T KNOW: Which way do you lean? METHODOLOGY Random sample of 200 live telephone interviews of likely City of Eugene 2014 General Election voters conducted February 11 through 14, 2014. Margin of error at the sample median is 7 percent. 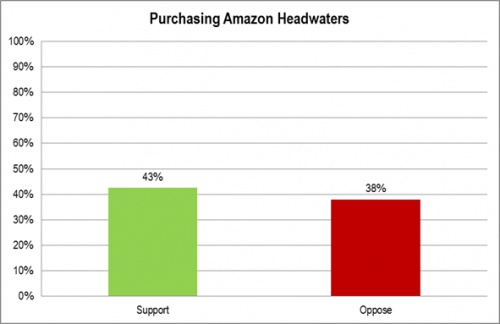 Should Eugene Purchase the Amazon Headwaters? There is limited support for purchasing the Amazon headwaters. 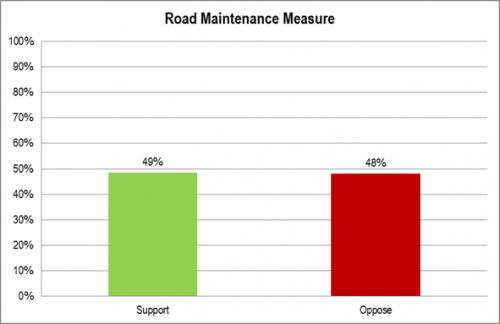 However, it is important to note that nearly 20 percent are undecided on this issue. This means that Eugeneans are yet to pay much attention to the issue. QUESTION Do you support or oppose the City of Eugene buying land near the Amazon Creek headwaters in south Eugene? IF DON’T KNOW: Which way do you lean? Category: Eugene and Lane County, Political | Comments Off on Should Eugene Purchase the Amazon Headwaters? 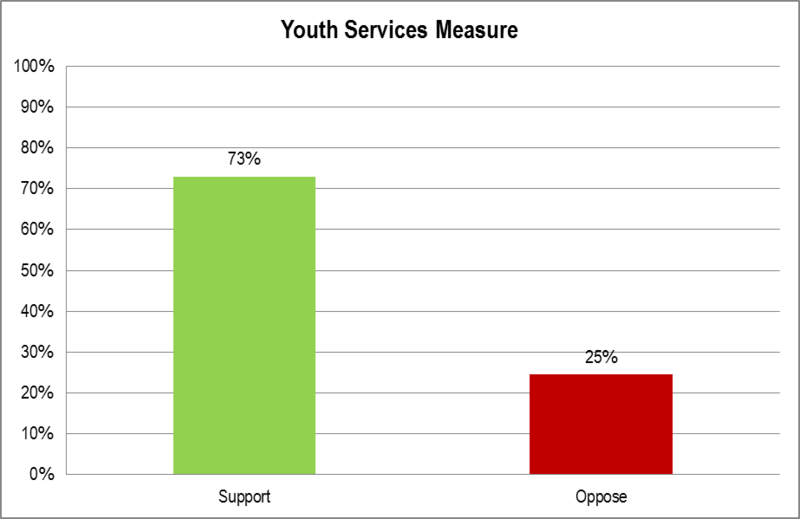 Replacing the Serbu Youth Campus Bond passed in 1995 with a youth crime services measure is strongly supported. There are several caveats. This is very early. Also, countywide support tends to be about five to ten percentage points below the Eugene levels. However, support now is still 73 percent. Someone should consider putting this on the ballot. QUESTION The Serbu Youth Campus Bond that passed in 1995 will be retired in 2015. It generates about $3 million a year. If the election were held today, would you support or oppose a property tax levy at the same total amount per year to support child abuse investigation and/or other youth services programs? IF SUPPORT OR OPPOSE: Is that strongly or somewhat? IF DON’T KNOW: Which way do you lean? It’s clear that the YMCA proposal is the favorite, though not by a clear majority. The City of Eugene proposal comes in third. QUESTION Do you support the Eugene School District 4J selling it to the City of Eugene, YMCA, or Fred Meyer [ROTATE ORDER]? The survey questions in the Monday, Tuesday, and Wednesday posts were asked in the order: Monday’s then Wednesday’s then Tuesday’s in order to minimize order effect bias. The specifics of the City of Eugene plan to buy Civic Stadium meet with a clear disapproval. The evolving questions and uncertainty clearly have taken a toll on support. 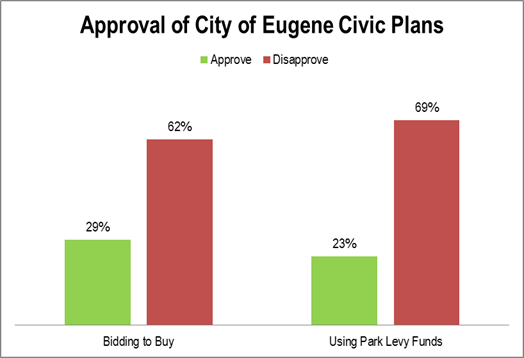 QUESTION Do you approve or disapprove of the City of Eugene _______ 1. bidding to buy Civic Stadium? 2. using Park Levy funds to buy Civic Stadium? The Civic Stadium issue has become very prominent. It seems clear that Eugeneans are very familiar. This level of uniformly very high familiarity means that it is very likely that viewpoints have changed. QUESTION How familiar are you with ________________ very familiar, somewhat familiar, somewhat unfamiliar, very unfamiliar? 1. Eugene School District 4J’s proposal to sell Civic Stadium? 2. 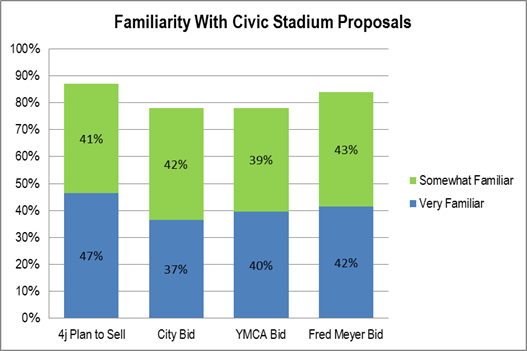 The City of Eugene bid proposal to buy Civic Stadium? 3. 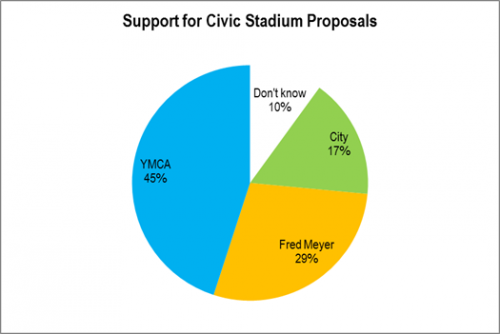 The YMCA bid proposal to buy Civic Stadium? 4. The Fred Meyer bid proposal to buy Civic Stadium? N.B. #2 through #4 rotated in order to reduce potential order effect bias. Subsequent diagnostic analyses imply the effect was minimal. There is one clear message from the analysis during the past few weeks: Unusual tax measures have a problem. If the City of Eugene places one on the ballot then a range of other factors would need to be above average: the need has to be clear and the amount has to be low. The assumption is that Mayor Piercy’s trust level and the state of the economy are out of the measure designers’ control. 2. The surge in “No” voters the last week. 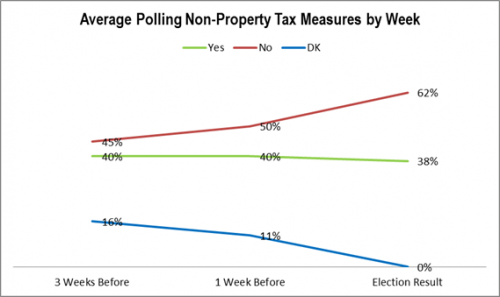 The data are the polling from three weeks out, one week out and the results on Election Day. Three weeks is just before the ballots are mailed. What is interesting is how well this measure started compared to the other measures. This could be because the tracking started much earlier. Support dropped as it did for the other measures, only much faster. City of Eugene Measure 20-211: Monthly fee for City fire, police, homelessness and other services. Shall City maintain fire, police, homelessness and quality of life services with monthly fee capped at $10 for residences? IF YES/NO: Is that strongly or somewhat? IF DON’T KNOW: Which way do you lean? 200 live telephone interviews were conducted of likely May 2013 City of Eugene Special Election voters on each of April 2-3, April 29-30, and May 13-14, 2013. The margin of error at the sample median was 7 percent. 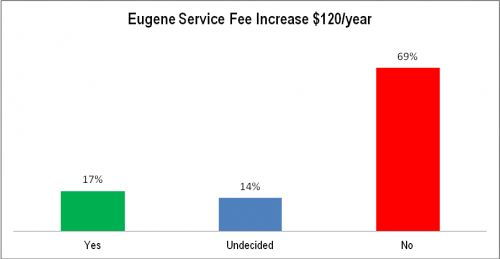 It was clear before hand that Eugeneans would decisively reject the proposed service fee increase. These numbers are obviously biased against the proposal. The service cuts are not mentioned. However, this indicates how important the specific service cuts are for any measure of this kind – just to keep it afloat for a small time. Stay tuned for the next post for the tracking on this measure when it was on the ballot. 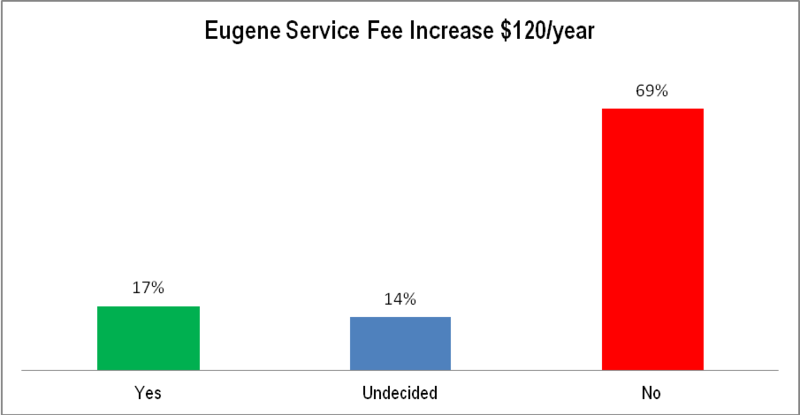 If an election were held today, would you vote yes or no on a City of Eugene service fee increase for all households and businesses of $120 per year? 200 live telephone interviews of likely City of Eugene General Election voters conducted January 23-24, 2013. The margin of error at the median is plus or minus 7 percent.